Download Restaurant Flyer Templates Free PSD. 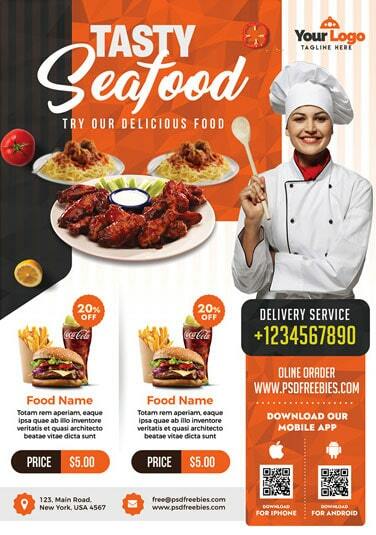 This Free PSD Flyer Templates Free PSD is suitable for any kind of restaurant, cafe, fast food, steak house, Catering, Grill bar and many more. You can use this flyer design as a traditional print advertising, magazine advert, newspaper ads and promotional posters. Freebie Included with 4 Color variations. This Free Flyer Templates is super simple to edit and customize with your own details using Adobe Photoshop. Simply add your food images and text. This template download contains a a4 size, 300 dpi print-ready CMYK psd files. This Restaurant Free PSD Flyer Template is available for Free Download.